Superior Learning Academy - Get Involved. Make Friends. Enjoy Motherhood. 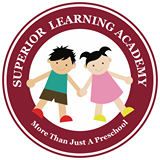 Superior Learning Academy is a state licensed, curriculum based preschool that will help your child love learning! Opening in January 2016, Superior Learning Academy will be located locally in Superior near the Target and Great Play in the Superior Marketplace. We provide highly trained teachers who have a passion for teaching and engaging young children through age appropriate activities and events! Zoo Phonics Reading Program, Writing Without Tears, math menus, science adventures, music and Spanish are just a few of the many ways we will entertain and engage your child. *Summer day sessions (9am-1pm), Summer camps (1pm – 4pm) and Holiday Camps will be available.